Submitted by Alexander Briones on Oct. 2, 2018. First published on Oct. 25, 2016 and last updated on Oct. 2, 2018. Reverb refers to the reflection of sound as it bounces off physical objects, and guitarists have always fancied manipulating this effect. So much so that it continues to be widely used, resulting in a wide variety of reverb pedals flooding the market. Here we present you with a detailed look into what the market considers as the best reverb pedals, along with important pointers to keep in mind while choosing. Subtle use of reverb is the norm because it adds realism, space and warmth to an otherwise dry guitar sound. It can also be used to create unique sound textures, or to totally change the sound. This versatility and usefulness make reverb pedals a valuable tool to have regardless of your playing style. 92 out of 100. Incorporating 425+ ratings and reviews. 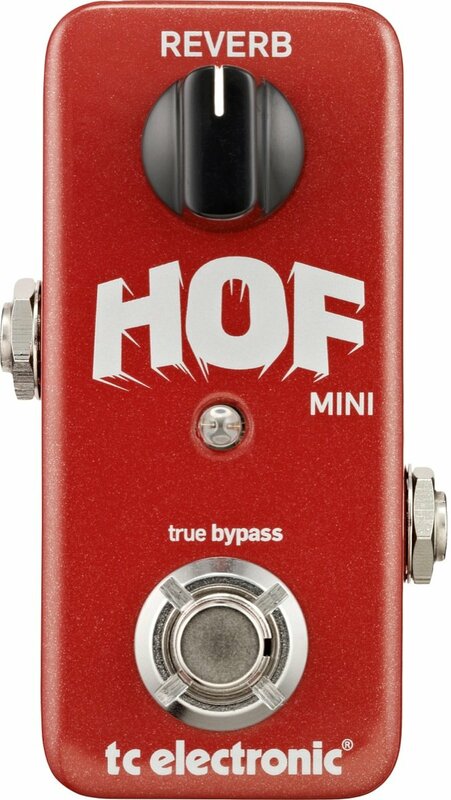 As the name implies, the Hall of Fame Mini is a miniature version of the original pedal of the same name, carrying over most of its features - including its Tone Print technology - while keeping the form factor small and stripping down the controls to just a single knob and footswitch. While realtime control on the pedal is obviously limited, the built-in Tone Print technology inside the pedal allows you to load different reverb types onto the pedal, which essentially makes it as versatile as the regular sized version. With Tone Print, you can load up familiar reverb algorithms or use presets that were created by virtuosos like Paul Gilbert, Steve Vai, Steve Morse and many more. And since you can do deep editing to a wide range of parameters via the Tone Print editing software, you actually have as much detailed control over the resulting reverb effect as you would with the bigger pedal. Dimensions (HxWxD): 4" x 2.8" x 2.5"
The HOF Mini's versatility, sound and built in relation to its compact size helped it win the approval of many reviewers. Many were simply astonished with how flexible this compact pedal can be, given that it can also help save precious pedalboard space. For the price, sound quality was not compromised, as attested to by majority of their users. There are some who did not like the quality of certain Tone Print presets, but still liked the pedal overall. One notable concern however is about the pedal requiring an isolated power supply, with a few reporting subtle high pitch noise when powering the pedal with the power supply they have on their pedalboard. If pedalboard real estate is running low, or you want to save on cost but still want good flexibility, then check out the TC Electronic Hall of Fame Mini. 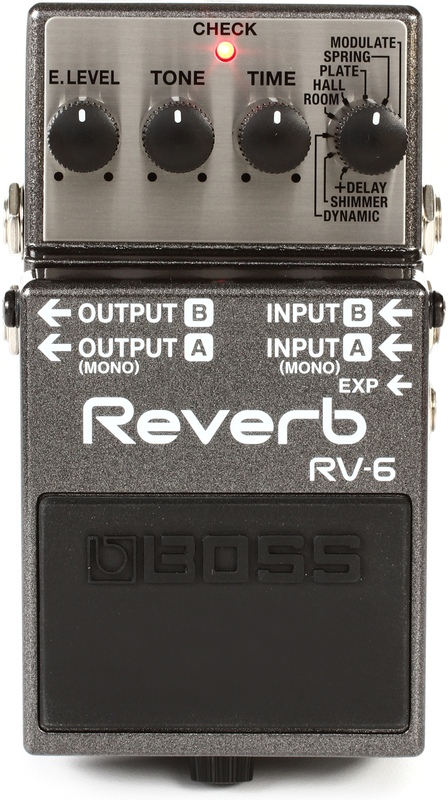 The RV-6 is a digital reverb pedal and currently the highest rated one from Boss. With its 8 reverb types, there's literally quite a lot of room to breathe for your guitar signal, from subtle room to modern shimmer and echo-delay. It has enough versatility and features for even experienced players and professional musicians to appreciate, while retaining an intuitive interface that even novice players can use. Artists that are known to have used the Boss RV pedal include Joe Bonamassa, Brian Welch Gary Moore, KT Tunstall, J Macsis, John Fogerty and many more. Input: Stereo 1/4", Expression Pedal 1/4"
Dimensions (HxWxD): 2.375" x 2.875" x 5.125"
Excellent, amazing, very good and great are just a few of the many positive adjectives that the Boss RV-6 has been receiving from their many satisfied and happy users. Many describe the sound as pro-level recording quality, matching more expensive rackmount digital reverbs that only the privileged few have access to. The room, hall, plate and spring reverb modes were mentioned frequently in a positive manner, while others found the shimmer setting to be perfect for modern ambient and sonic texture crafting. Other commonly mentioned good traits of the RV-6 include its versatility and ease of use. There was one customer who found the reverb trails to be lacking in realism - but almost everyone else found to sound to be exemplary, even the few that received the pedal with minor production issues like a sticky knob still rated the pedal highly. With its great balance of affordability, versatility, and quality, the Boss RV-6 Digital Reverb pedal easily gets our recommendation. Delay and Reverb continues to be a potent combination that guitarists look for, and based on the many positive reviews that it continues to amass, the Keeley Caverns V2 must've done it right. This pedal lets you choose from three different reverb types, first of which is the Spring reverb mode which replicates vintage Blackface-style reverb complete with tremolo modulation. Second is the Shimmer Reverb mode which adds octave-up effect which enhances the upper frequencies. Finally, the third mode is called Modulation Reverb, which adds chorus effect to reverb. All these features work in conjunction with its analog tape style delay, with up to 650ms of delay time and wow/flutter modulation. Another feature to look out for is its top mounted input/output jacks, which is important when planning your pedalboard. Dimensions (WxD): 3.7" x 4.7"
Astounding, as one user put it, nicely captures how most users feel about the Keeley Caverns V2 pedal. From its boutique like sound quality, to its solid build and aesthetics, it gets a lot of positive remarks from satisfied guitarists. It even gets some praise from bassists who report that the pedal works well for them too. Many also appreciates its versatility, thanks to its multiple modes and added delay. While most users are happy with its overall quality, there are some who report minor cosmetic issues. There are also those who feel that the reverb sound does not fit their preference. 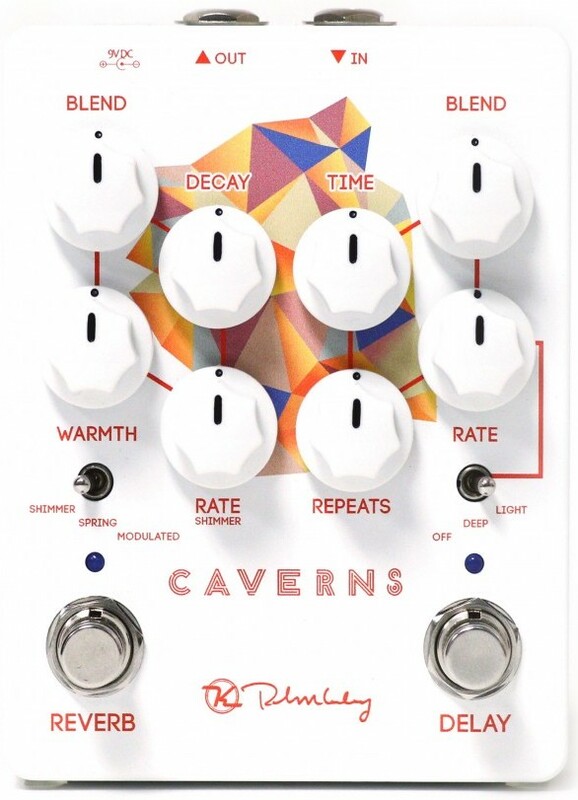 The Keeley Caverns V2 is a versatile yet old school style reverb with delay effect that will fit most playing styles. 96 out of 100. Incorporating 100+ ratings and reviews. EarthQuaker Devices, known for their boutique quality pedals, designed the Avalanche Run to be a versatile pedal - and they seem to have done a really good job with its incredibly high ratings. It is essentially a digital delay and reverb pedal packed into one unit with stereo input and output and quite a lot of features. It lets you pick between multiple modes which include normal, reverse, swell and tails, all of which work with its tap tempo and six time division settings. It also allows for expression pedal control in case you want realtime foot control over the reverb or delay effect. Dimensions (HxWxD): 3.5" x 5.25" x 6.75"
Well loved for its ambience making functions, response to the EarthQuaker Devices Avalanche Run is overwhelmingly good. And its not just about sounding good, because many users report that the pedal inspires them to try a different approach to playing their guitar parts. The pedal's versatility also gets a lot of praise, with many recommending the pedal as ideal for those who want to create distinct soundscapes via reverb and delay. With its high ratings, there's no standout complaints to write about. Although it would be understandable that the Avalanche Run will not appeal to those who want basic, no frills reverb. 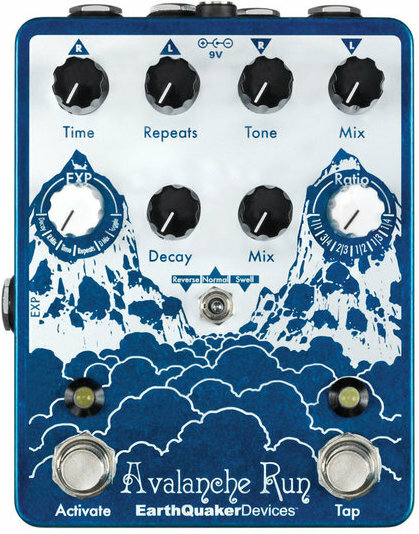 With its ambience and soundscape making capabilities, the EarthQuaker Devices Avalanche Run is highly recommended to those who want to experiment with reverb and delay. The Strymon blueSky pedal is the smaller and more affordable sibling of the popular Bigsky reverb pedal. And like its big brother, it is doing very well in the market, to the point that it is now sharing the top spot with the Bigsky Pedal in this list. It features three reverb modes, plate, room and spring, along with a variety of controls that allow you to personalize your reverb sound. These controls include high and low damping, dry/wet mix, decay, pre-delay, mix and dedicated switches for modes and reverb type. Dimensions (HxWxD): 4" x 4.5"
Reviews for the Strymon blueSky continue to be overwhelmingly positive, exceeding the expectations of many to the point where some even claim that it is the best reverb pedal that they have tried. Almost all users are happy with how transparent it sounds, even when used on overdriven guitars. Some even report getting great results when used on vocals in the studio. There are also a lot of commendations that point to its tweakability, where it proved to be useful in both subtle or lush reverb settings. There are only very few complaints about the pedal, most of which point to its premium price tag. 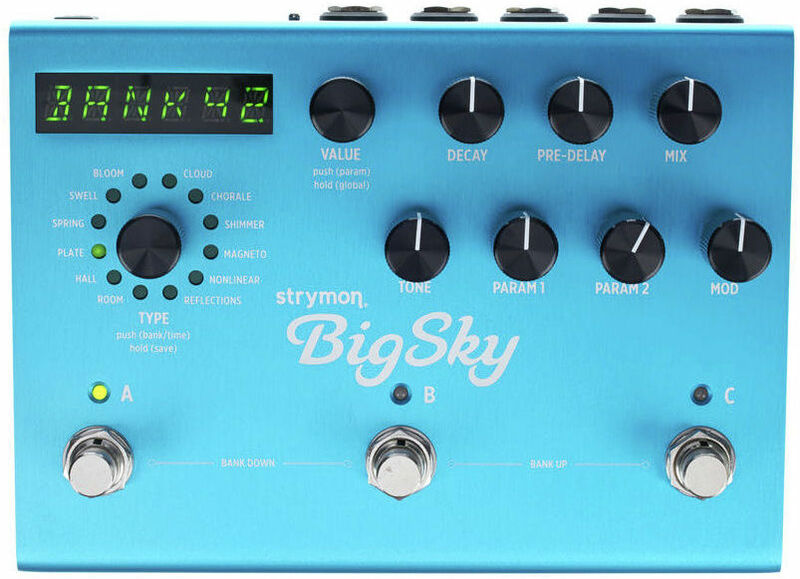 Some also recommend saving up for the Strymon Bigsky, which has more features yet is priced a bit close to the blueSky. 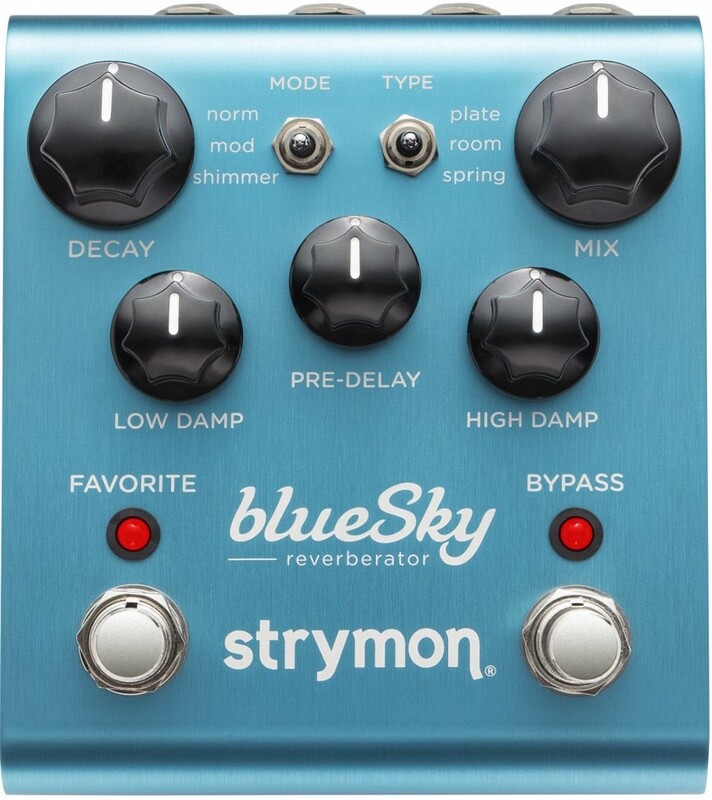 If you are looking for boutique quality reverb that is not too complex yet has good depth - and you want nothing but what the market deems as the best - then go for the Strymon blueSky. 97 out of 100. Incorporating 275+ ratings and reviews. The California based boutique pedal builder Strymon has built quite the reputation for their quality effects, and the BigSky Multidimensional Reverb is one of their most sought after products. From artists to church musicians, there is so much hype surrounding the brand, and the high ratings that the BigSky receives only helps to confirm and further establish their popularity. With 12 reverb types you have a wealth of virtual space options for your guitar signal, while the expanded control options allow for deep customization. Other features that make this pedal a true professional's favorite include advanced input/output options, 300 customizable presets and its MIDI compatibility. This pedal has a long list of professional artist users including Dweezil Zappa, Dave Kilminster, Tom Quayle and many more. Dimensions (HxWxD): 6.75" x 5.1"
The overall sentiment of many users confirms Strymon's claim that this unit offers studio rack quality reverb effect in a pedal form factor. Many users even found time to think-up unique and interesting adjectives to describe how happy they are with the unit, including magical, heaven in a box, super, epic, and many more. A big number of users rated the Strymon Bigsky highly for its studio quality sound, while a big chunk of experienced players found the pedal's versatility to be its strongest point. Quiet noise free operation, which is a requirement for studio gear, was also mentioned a number of times. There really aren't any specific complaints about its features or sound, but there are a few who would've been happier if the price was more accessible. When budget is not an issue, and you're looking for a top shelf reverb pedal that can double as your studio reverb rack, then get the Strymon BigSky. Just one glance at the Eventide Space Reverb's array of knobs and you know that this is not your average reverb pedal. With multiple knobs for controlling deep settings, 12 different reverb types to choose from, and 100 presets, this pedal offers a lot of tweaking options. But it's not just about versatility because this pedal features the same reverb algorithms as found on Eventide's rack processors. Modern control options are also available, including MIDI compatibility, MIDI clock sync and tap tempo. Known Eventide Space Reverb users include Tim Reynolds, Alex Skolnick, Nigel Hendroff and many more. Bypass Type: Configurable to True Bypass or Buffered. Also has a Buffered Bypass option that cuts off the tail end of the reverb. Dimensions (HxWxD): 4.8" x 7.5" x 2.12"
Sound quality is what impressed most of the reviewers. 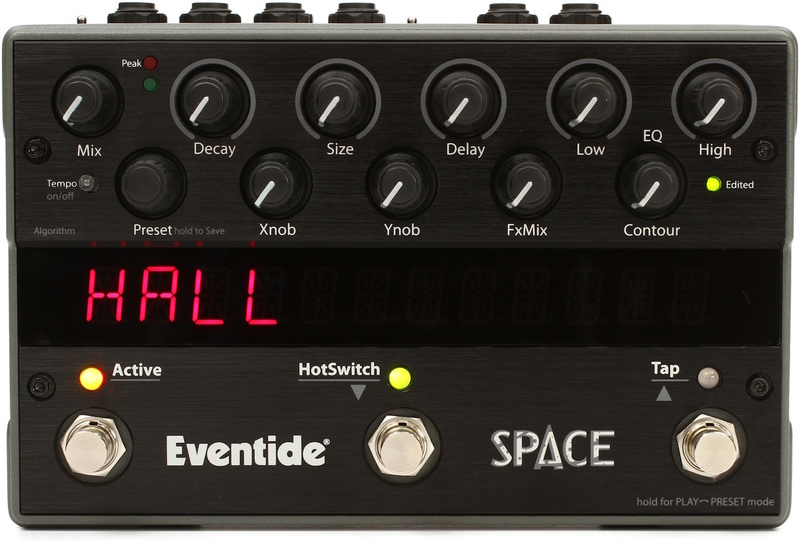 The general theme of what they are saying is that the Eventide Space Reverb simply sounds great. Versatility also got a lot of thumbs up, especially from more experienced users who want precision control over the reverb effect. Interestingly, even non-guitarists were impressed by the pedal's sound quality, including musicians who are into ambient style music, reporting that they were able to conjure inspiring and unique soundscapes. There were some who raised concern about the complexity of the interface and overall learning curve. A few reviewers complained about the quality of the knobs considering the price, and speaking of price tag, some users would've given the pedal a higher rating if the price was a bit lower. The Eventide Space Reverb pedal is for you if you have the budget and are into modern ambient music, or if you want a reverb pedal that will give you hours of deep editing fun. Digital Signal Processing and Convolution technology have allowed us to better replicate the ambience of actual physical rooms, modify their parameters and even create our own rooms. Below are the most common reverb types along with a feature on special types that don't fall under the four main types. As the name suggests, it replicates the quick sonic bounces of a regular room. With its early reflections and quick decay of no more than a second, room reverb is the most discrete of the lot, so it is often used for adding subtle warmth and realism. Hall reverbs are usually based on the actual acoustic space of a large music hall, only digitized for use with your pedal. Since the virtual space is bigger, the decay is usually longer, ranging from 1 to 3 seconds. It is usually employed to give the guitar sound a three dimensional ambience to emphasize certain parts. especially in rock music. The plate reverb mode found on guitar pedals is a digital simulation of an analog plate reverb which was widely used in the past. It works by sending your guitar signal to a virtual metal plate that vibrates to create the reflections and echoes that are usually very quick and full. This reverb type tends to be brighter, and is commonly used for subtle enhancement. Like plate mode, the spring reverb mode is a digital emulation of an actual analog reverb unit that is driven by a metal spring. The resulting reflections are fast and decay quickly, while the bass frequencies roll off as the sound decays. This makes the resulting sound brighter than other types, making it the ideal reverb for many guitar styles that emphasizes the upper frequencies, including surf, country, and blues. With so much processing power at our disposal, manufacturers have been experimenting with other ways of providing reverb, outside of the usual room emulation. This has resulted in special reverb types that include Reverse (reverses the sound reflection), various types of Modulation (applies modulation effects to the reflections including flanger, chorus, phaser etc), Filter (applies sweeping eq filter effects to the reflections) and many more. These reverb types are usually employed for more experimental and modern sound ambience. The general idea is that more control knobs allow for deeper editing and better personalization, at the cost more complex setup and interface. So if you are looking to add subtle reverb that's always on to enhance your sound, you're better off with tried and tested classic pedals with as few configuration controls as possible. The opposite is true if you want more control and options, be it for customizing or for crafting the textures of your sound reflections. Right at the get go, you can narrow down your choice by establishing a reasonable budget range. Note that you'll want to invest a bit more if reverb is a primary part of your sound, especially for ambient and experimental guitar styles. We know that pedalboard real-estate is also an important consideration, so we have provided the dimensions of the pedals above. Some guitar tone purists look for true bypass pedals as they totally 'bypass' the pedal's circuitry when the effect is switched off - leaving it just like you're plugged directly in to the amp. However one thing to be aware of with reverb pedals is true bypass will cut off the reverb decay as soon as you hit that switch. Some people might find this a little jarring. Buffered bypass pedals continue to feed their output actively so the tail end of that huge cathedral sound can continue to sweep over as you're starting to play the next 'dry' part. A number of these pedals can be configured to either true or buffered bypass. Of course if you're planning to leave your reverb pedal switched on the whole time then it's always being buffered so there's no difference. To ensure the usefulness of this guide, we limited our scope to reverb pedals that can be readily bought from US based retailers. We also disregarded multi-effects pedals which come with reverb, and focused more on standalone ones and those that feature the popular Reverb + Delay combination. From among these pedals, we took a closer look at popular and top rated ones. For this update, we ended up gathering close to 5,400 reviews and ratings data for the 20 reverb pedals that were short listed. All these data were then fed into the Gearank algorithm, which we used to narrow down the list to just the best of the best. For more information see How Gearank Works. Submitted by Mark (not verified) on Nov. 25, 2016. Great roundup! I think the Hall of Fame is superb for the money. Submitted by Jason Horton on Sep. 26, 2017. Today we removed the Boss FRV-1 63 Fender Reverb Pedal from the recommended list above due to a lack of availability. You can still read what we have to say about it at: Boss FRV-1 63 Fender Reverb Meta Review. Submitted by Mike (not verified) on Oct. 6, 2018. What about Fox Pedal's Wave or Magnifica Deluxe? We only allow Reverb or Dual Reverb/Delay pedals in this guide and the Foxpedal Wave has reverb, delay and modulation effects making it ineligible. The Foxpedal Magnifica Deluxe looks promising but we didn't find the reviews we needed to publish a rating for it so we couldn't recommend it at this stage, but it's on the short-list to be considered when we next update this guide.